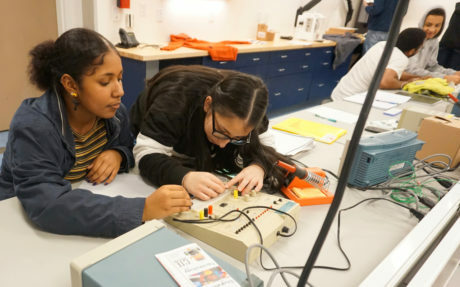 This month, Berkeley High students in the Mechatronics Engineering “Electrical Tech” class were able to get plugged into their new lab/classroom housed at the Berkeley Adult School. Now in its pilot year, the class taught by Dirk Wright meets once a week, on Wednesdays from 4:00 to 7:00 p.m. It had been meeting in a classroom next door while work on the lab/classroom was completed. Part of the high school’s Career Technical Education (CTE) offerings, the class provides hands-on instruction in designing, building and maintaining the electro-mechanical systems that undergird our lives. The class was developed in partnership with EBMUD and Los Medanos College. The lab is equipped with specialized wiring, tools and machines that enable students to acquire basic skills and advance into developing individual projects. Their final projects could be, say, a drone, autonomous vehicle or some other example of consumer electronics, Mr. Wright said.